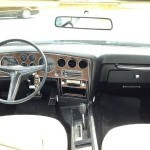 The Pontiac Grand Prix initially served as Pontiac’s performance model. 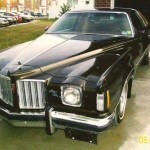 For its third generation, the Grand Prix began its transformation from a performance car to a personal luxury car that was becoming popular in the early seventies. 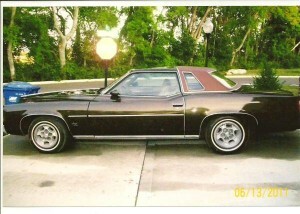 In this segment, the Grand Prix competed with such cars as the Monte Carlo, Cutlass Supreme and Ford Elite. 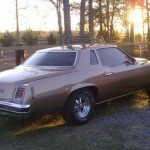 For 1973, the Grand Prix, along with all GM A-bodies were redesigned. The new Grand Prix was larger and heavier, due to the federally mandated 5 mph crash bumpers and to pending roll-over standards that were never enacted. 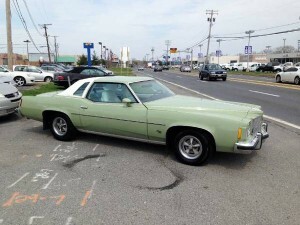 Due to the pending roll-over standards the Grand Prix was no longer a pillarless hardtop, but became what GM called a “Colonnade” hardtop, which included fixed rear “Opera” windows instead of disappearing rear windows. 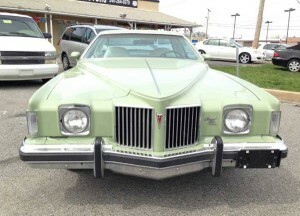 The front and rear styling of the 1973 Grand Prix was an evolutionary design of the previous generation Grand Prix with a vertical-bar V-nose grille and single headlamps. 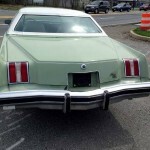 The rear featured a boattail-like trim with square-taillights above the bumper. 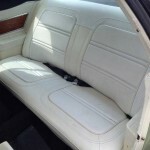 Inside, the Grand Prix had a wraparound instrument panel that continued the theme of previous model with new African Crossfire Mahogany facing on the dashboard, console and door panels. 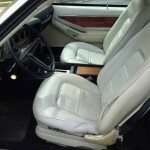 The Grand Prix now featured Strato bucket seats with higher seatbacks and integrated headrests in Morrokide or scivvy cloth trims, and optional recliners and adjustable lumbar support, with a notchback bench seat offered as a no-cost option. Powering the Grand Prix was a 400 cubic inch V8 rated at 230 horsepower matted to a Turbo Hydra-Matic transmission. A four-barrel 455 cubic inch engine was optional and included with the “SJ” option that also added a rally gauge cluster and a radial tuned suspension with front and rear sway bars, Pliacell shock absorbers, and radial-ply tires. Changes to the Grand Prix were minimal in 1974. 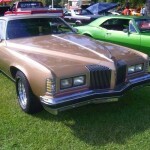 The Grand Prix received a revised split grille with vertical bars that was entirely above the bumper. 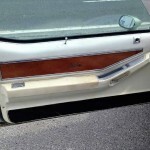 The rear boattail effect was softened due to a new federally mandated 5 mph bumpers. 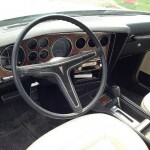 The major change was that last year’s African Crossfire Mahogany trim was replaced by a simulated material for the instrument panel due to splintering problems on 1973 models. Also, cut-pile carpeting replaced the nylon loop rugs of previous year’s model. Sales of the Grand Prix dropped from last year’s record of around 150,000 units to just under 100,000 units. 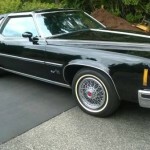 The drop can be attributed to increased competition with other makes entering the personal-luxury car market, such as, the Mercury Cougar and Ford Elite. 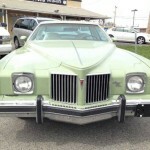 Pontiac did not mess with success of the Grand Prix in 1975. The grille was revised again with fewer vertical bars and revised taillight lenses marked most of the exterior changes. 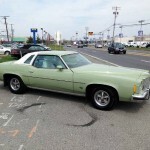 Other changes included the addition of GM’s High Energy electronic ignition and a catalytic converter that mandated the use of unleaded gasoline. A new luxury LJ model was added as the top -of-the-line model. The Grand Prix lineup consisted of the base Model J, the mid-level SJ and the new luxury edition LJ. Also, 1975 also marked the beginning of the catalytic converter, which also marked the end of dual exhaust and detuning of the engines. 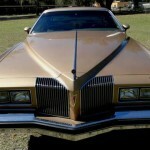 The 400 cubic inch V8 dropped from 230 to 180 horsepower and the 455 cubic inch engine dropped from 250 to 200 horsepower. 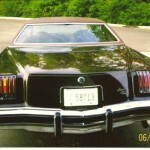 New for 1975 was a more economical 170 horsepower 400 cubic inch engine with two-barrel carburetor. 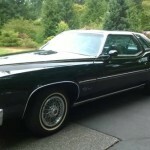 Sales continued to drop to 86,582 units, as the Grand Prix was in its third production year and Chrysler Corporation introduced it personal luxury twins the Chrysler Cordoba and Dodge Charger SE. 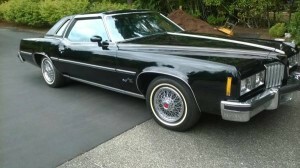 To celebrate Pontiac’s 50th anniversary, a number of special edition Grand Prix were produced. 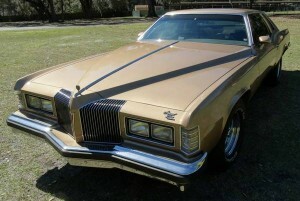 These models were based on the LJ model, featured removable Hurst T-tops, Rally II wheels, special “Anniversary Gold” paint, which was actually the new Cadillac Seville’s “Autumn Gold” paint. 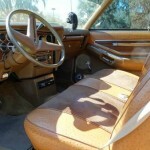 Other distinctions included special badging with Golden hood and trunk medallions and a Golden “arrow head” logo in the sport steering wheel. This would be the last year for the third generation Grand Prix. with a new model waiting in the wings for 1978, the 1977 Grand Prix would carry on with minimal changes. The grille was revised with fewer vertical bars, a stand-up hood ornament and revised taillight lenses with “GP” logos highlighted most of the changes. The base model “J” got Pontiac’s new 135 horsepower 301 cubic inch V8 as standard equipment. 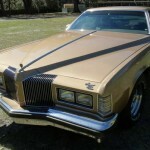 Sales increased to an all-time high of over 270,000 units for 1977 despite competition from the downsized 1977 Ford Thunderbird and Mercury Cougar. 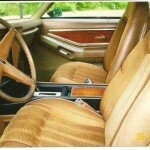 For 1978 all A-bodies, including the Grand Prix, would be downsized as GM moved towards more fuel efficient vehicles. 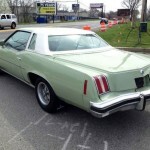 For more on the Grand Prix, see our post on the 1969-1972 Pontiac Grand Prix. 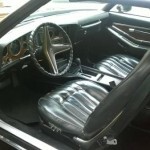 For other Pontiacs, see our post on the 1967-1969 Pontiac Firebird. 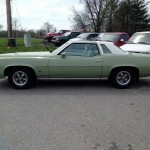 To find or sell a Classic Car, see the listings in Classics for Sale. 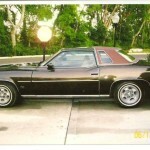 This entry was posted in Grand Prix, Pontiac and tagged A body, Cordoba, Cutlass, Elite, Grand Torino, LeMans, Monte Carlo, Regal, Torino. Bookmark the permalink.